Tenorshare Video Converter 5.0.0.1 was available as a giveaway on March 3, 2017! Tenorshare Video Converter is an all-in-one video conversion tool, which helps you convert various videos for playback on maxi-multiple players such as mobile devices, TVs, and other players. 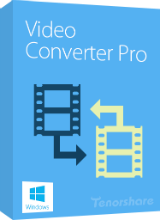 You can convert common video formats like MP4, FLV, VOB, XVID, MPEG, WMV, MOV, VOB, AVI, etc. It is fully supported camcorder recorded HD videos like MTS, M2TS, TS, TP, TRP, etc. And the program performs excellently on audio conversion like MP3, M4A, AC3, AAC, WMA, WAV, OGG, APE, etc. How would you improve Tenorshare Video Converter 5.0.0.1? 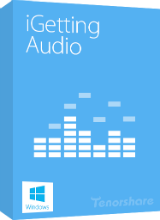 Tenorshare iGetting Audio is a program that can record any online streaming audio freely and with no quality loss. You can record all digital audio sources that play on your computer, record internet radio free from your favorite radio channels, such as BBC radio; record Skype or conference conversation that’s often done in businesses or call centers for quality assurance; record human vocals through microphone to make your own musical pieces to share with your friends. All audio can be recorded from video as well as audio streams, like Youtube, Vimeo. Download it to record Audio Now. 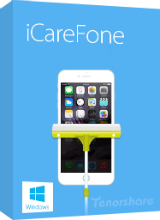 Tenorshare iCareFone is an easy-to-use software for users to improve their iOS devices in top performance, including iPhone, iPad and iPod. This program is professional in the field of Files Transfer. You can transfer all files between devices and pc quickly and easily. There are 6 features in it, which are Files Manager, Speedup and Clean, Backup and Restore, Fix iOS Stuck, Remove Ads and Repair System. You can choose one of them based on your device's problem and to deal with your problem with one click. Win 7 Ult, Sp1: Installs and registers and starts running all by itself. No gui on the single monitor I'm using. Task Manager shows it using up about 15% of the cpu as well........what's it doing???? Uninstalled. First "bad" program from GAOTD that I can remember IN YEARS. A few did not install, maybe fewer did not run..........BUT NONE ran without openning and without a gui. ............. Something new all the time. Win 7 Ult, Sp1: Installs and registers and starts running all by itself. No gui on the single monitor I'm using. Task Manager shows it using up about 15% of the cpu as well........what's it doing???? Uninstalled. First "bad" program from GAOTD that I can remember IN YEARS. A few did not install, maybe fewer did not run..........BUT NONE ran without openning and without a gui. ............. Something new all the time. my installation on to win 7 just disappears instantly after the .exe is done. key appears, then i can go to gaotd which tells me it is activated.three tries,three activates, three fails,tried on my xp,perfect. Had Streaming Video Recorder running at the same time. 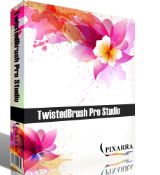 Installed this software. It never ran and somehow or another winmm.dll was messed up to the point that it was find my backup disk time..... Lucky I had it. Program seemed to install OK, but would not launch. Windows 10-64bit. Disabled AVG but still failed to install. Then said it did install. But it didn't. Disabled AVG but still failed to install. Then said it did install. But it didn't. This happens too much. Windows Vista 64 bit. Downloaded, installed and registered, NO Problems! Tried to convert file, worked great with really good results. Video very clear and crisp, audio near perfect But each time I tried a different format always ended up with a new video at least twice the size. needed to shrink video from 9.2meg to around 2meg. No luck! Must be doing something wrong? Downloaded, installed and registered, NO Problems! Tried to convert file, worked great with really good results. Video very clear and crisp, audio near perfect But each time I tried a different format always ended up with a new video at least twice the size. needed to shrink video from 9.2meg to around 2meg. No luck! Must be doing something wrong? Painfully slow, plus drag and drop does'nt work have to go through the search process must make sure you get the little tick in the box otherwise conversion won't start, will scrap it tomorrow waste of time, will go back to the freebee of a couple of weeks back 7th share runs rings around this one! Just like many others, it shows in task manger but never really launches! Uninstalled as fast as I could and will pass on this software that doesn't even show where their company is! DRDNA, the trial also did not work. I normally work with mkv for video and flac for audio, don't see either mentioned. CCExtractor for subtitles. "I normally work with mkv for video and flac for audio, don't see either mentioned." Installed but the program doesn't work. Reinstalled twice, and when the program icon is clicked, it keeps connecting to a site advertising Tenorshare's products instead of working. Don't know why. Anyone has any idea, please? After it failed to install 3 times I went to " tenorshare dot com/tech-spec/video-converter.html " and downloaded it from there. I used the email & code from the text file from the GAOTD file and it registered OK. Seems to be working -- so far! abc8808, After it failed to install 3 times I went to " tenorshare dot com/tech-spec/video-converter.html " and downloaded it from there. I used the email & code from the text file from the GAOTD file and it registered OK. Seems to be working -- so far! What kind of a trick is this? I received this Giveaway at 5: 38 TODAY, download and installed it. When I went to the url provided, I received this message:"Giveaway of the day promotion has ended! You can still get Video Enhancer with a 30% discount if you use our Facebook promotion. " Would you be so kind as to check the date and time of your system? We have just tested the activation procedure and everything worked fine. I have the same problem of the program not showing up on the screen but being listed in the "Program Manager" as running. Can't enter registration data if it won't raise it's ugly head & show it's self! Will try re-downloading to see if that helps. Un-installing & re-installing from original download didn't work. Running Windows 10 64byte with all the latest updates. AFAIK the most common method nowadays is to have the subs in a specially formatted text file with the .srt extension. When that .srt file is named the same as the video file, & stored in the same folder, very many players for Windows, *nix, & Android can display them for you. One advantage is that displaying subs can be turned on/off using the player's controls. There are several apps for working with subtitles, depending on what you want to do... there are apps for typing them, adjusting their timing, using OCR on DVD/Blu-ray disc subs etc. floran kane , AFAIK the most common method nowadays is to have the subs in a specially formatted text file with the .srt extension. When that .srt file is named the same as the video file, & stored in the same folder, very many players for Windows, *nix, & Android can display them for you. One advantage is that displaying subs can be turned on/off using the player's controls. There are several apps for working with subtitles, depending on what you want to do... there are apps for typing them, adjusting their timing, using OCR on DVD/Blu-ray disc subs etc. floran kane , i expected it, no subtitles, also useless for me. Like the previous version 3.0 offered by GOTD on 16 March 2015, on my system this version does not work! but does not appear on screen. Does it support GPU acceleration encoding? Does it support Intel Quick Sync encoding? When you drag and drop a file onto it, you have to tick it, check it, otherwise after you click the convert button you'll get the message "please select the video file you want to convert! ", why don't it just select newly added files by default? Like most of video converters i've used did. In the settings "resolution" set to "original" but the the output file frame size is smaller than the original, i don't get it, it's not a keeper. When you drag and drop a file onto it, you have to tick it, check it, otherwise after you click the convert button you'll get the message "please select the video file you want to convert! ", why don't it just select newly added files by default? Like most of video converters i've used did. In the settings "resolution" set to "original" but the the output file frame size is smaller than the original, i don't get it, it's not a keeper. while F is not even visible in explorer since it's not connected as a removable drive. No problems with installation/registration but it chooses plugged in android device as its output directory F:/maketenorshare/VideoConverter2015.3.4/VideoConverter2015.3.4/tag/ConverterFile/ while F is not even visible in explorer since it's not connected as a removable drive. The moment you open the converter, the system hangs . Have to force shutdown. Tried reinstalling the software and disabled anti virus and malware still doesnt work.